Now available for iOS and Android devices. 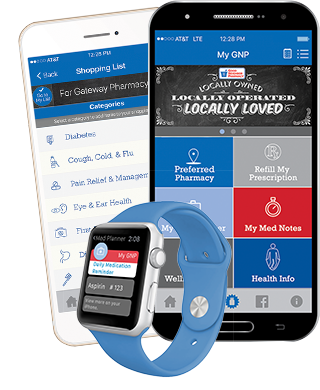 Create your pharmacy shopping list, customize alerts so you never miss a dose and now, refill prescriptions on your smart device. Create a personalized list to get the essentials from your pharmacy. A weekly calendar to coordinate medication doses and receive reminder alerts. Stay on track and allow a friend or family member to be notified when medications are missed. Save medication details, including dosage, side effects and food interactions; log Vitals and Immunization Records in one convenient location. Refill your prescriptions with the tap of a button.